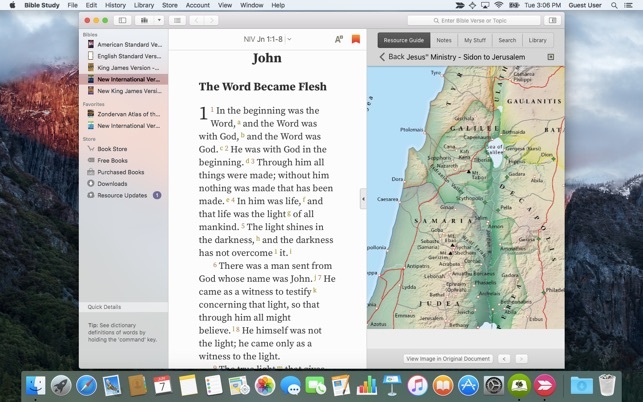 Designed for deeper Bible study, join over 4 million users on “The Bible Study App.” Learn from great scholars through thousands of resources including commentaries, maps, and dictionaries all available off-line. 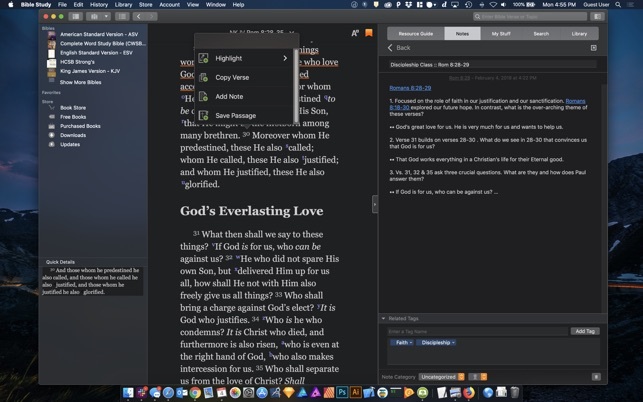 If you like to highlight Bible verses, take notes, bookmark passages and have everything sync to all your devices, then this is your Bible Study App. 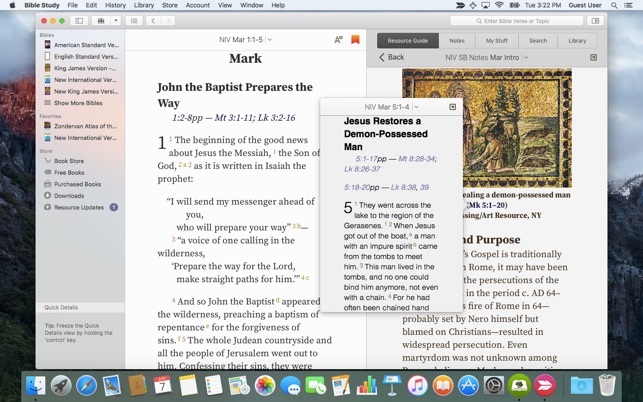 Sync your Bible study resources, bookmarks, notes, Scripture verse highlights, and book ribbons between any device with Bible+. With our one-of-a-kind Resource Guide, you can perform powerful searches through your entire Library of Bibles, Bible commentaries, Bible dictionaries, and more. 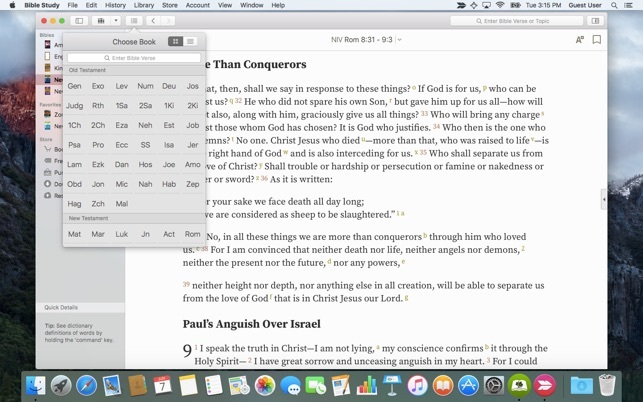 With our unique 3-touch Verse Chooser, you can navigate quickly and easily to the exact Bible verse you want. 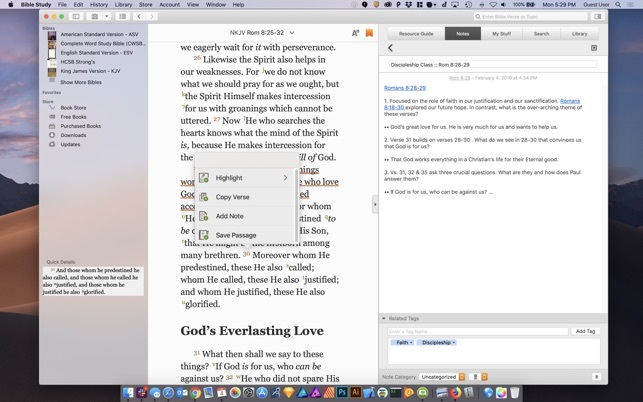 The split-screen view allows you to open two books at once to compare Bible translations, view your study notes while you read the Bible, or follow along with a commentary while you study Scripture. The Olive Tree collection of Bible study resources is constantly growing and offers over a hundred FREE resources and over a thousand titles available for purchase. Schlachter, and Elberfelder, Louis Segond, and more. This app works on all my devices and I use it every day. I love the reading plans, Bible Translations and study resources (love the Treasury of Scripture Knowledge). 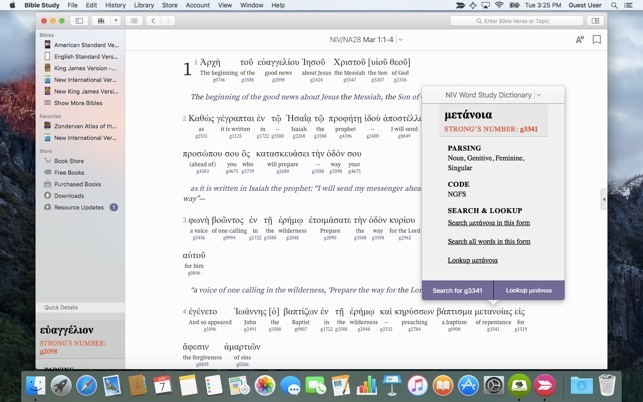 Great app to use for linking translations to Greek and Hebrew using Strong’s Concordance. Love the notes available like Dake’s. Update: January 31, 2018 - I read a review where the reviewer said the resource window was slow to update on the Mac OS X version. I use this app on my MacBook Pro (maxed out memory for better performance in general) and I’m not seeing what I would call “slow” response in the resource window updates as I change verses. I use the Treasury of Scripture Knowledge regularly and find the response to be very good as I scroll through verses and click on the TSK cross references to read the related verses. I also use Strongs and commentaries where I get the same good response. It’s not instantaneous, but the updates happen in under 2 seconds. Performance can be affected by other apps open at the same time and the amount of available memory. I do have to watch one particular website (LinkedIn) in Safari - if that is open then CPU utilization is high and performance degrades. I would suggest using “Activity Monitor” (you’ll find this app in APPLICATIONS/UTILITIES) to see what is using resources if you experience performance issues. Good but needs a refresh… STILL. Its been nearly 18 months and no update for the MAC/PC version? Love the app its just that the improvements seem to be a bit slow in coming at present. The ios version is stellar these days - the Mac version is good but could use a bit of a refresh maybe. UPDATE - Still no real change in the MAC version to date. In particular, when I change verses, the resource window is slow to respond. Also, if I search for a word or phrase, there should be a way to move that search to the main window but instead I have to retype the reference in on the main window. The non iOS version just isnt as elegant and smooth to use as its mobile counterpart. I use my MacBook and my iPads evenly so theres a clear distinction on UI, ease of use between them. Love the iOS version and tolerate the MAC version at the moment. Hoping for a refresh soon. UPDATE TO THE UPDATE - STILL STILL no real change. It’s functional enough but the same issue continues: You do a search and its a side window thing! Changing versions, using the resource guide etc. are all MAIN window functions predominately but the minute you do a search you have this wrangling to do if you want to research deeper. Just feels convoluted. I’d switch to a different app but I’m heavily invested in their ios versions so here I stay, for the meantime. I have used this app daily for a couple of months. And for the most part it is great, especially because it is free and one doesn’t have to pay to use the standard features. I like the choice of free bibles so I can compare translations.I enjoy the addition of non-biblical texts that are linked to the scriptures - no more sitting with two books trying to find the references - so I no longer have the tendency to skip the reference and am understanding more. Good search feature. Nice book sales regularly. Thanks for the ‘reading plans’. I recommend this to anyone looking for a digital bible. A few tweaks I’d like to see - 1. being able to highlight more than one verse at a time and have them remain together rather than as individual verses. 2. to highlight a portion of a verse and have it show up in all my bibles as highlighted. 3. Sometimes I just lose parts of the bible - ex, the other day everything after Matt 16 was gone and as I scrolled down to try to get to Matt 17 the program shut down. rebooting didn’t help that day but the next the entire book was back. This has happened several times in various books. I haven’t used this app to its fullest capacity yet and I look forward getting to know it better.